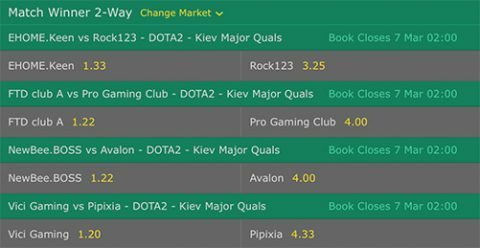 The qualifiers for the Dota 2 Kiev Major 2017 have started already and will run until the 13th of March, in addition we see the first betting odds for the Kiev Major go live. This is the chance to grab a spot in the tournament for the teams who haven't been invited directly by Valve. 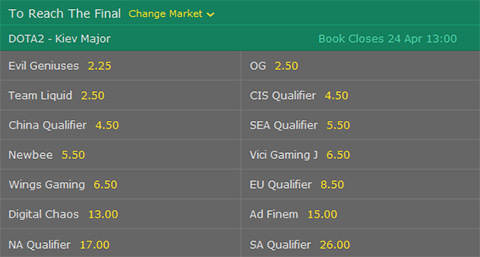 And for us to place some bets as eSport betting sites have released the first betting odds for both the qualifiers and the main event of the first Major tournament in 2017. Considering the massive overhaul of game mechanics with the newly released patch 7.0x (the exact patch version the Kiev Major is played on is currently unknown) it is not easy to say with confidence who is going to win the Kiev Major or to bet on it. However, everyone who has been following the competitive Dota 2 eSports scene can sense which teams are comfortable and strong on the current patch and which still need time to adapt. Either way it is going to be an exciting tournament, both for the fans and for the participating teams. Disregarding the well deserved price money for the winners, it is also a strong indication for Valve on who to invite to The International 2017. These bookmakers are licensed to offer real money esports betting in most European countries, Canada, Australia, some parts of South America and Asia. bet365 have already released their betting odds and currently they offer three different options for bets. 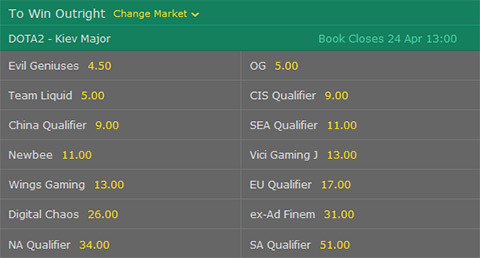 Lets take a look at each one, or if you want to learn more about betting on Dota 2 click here. 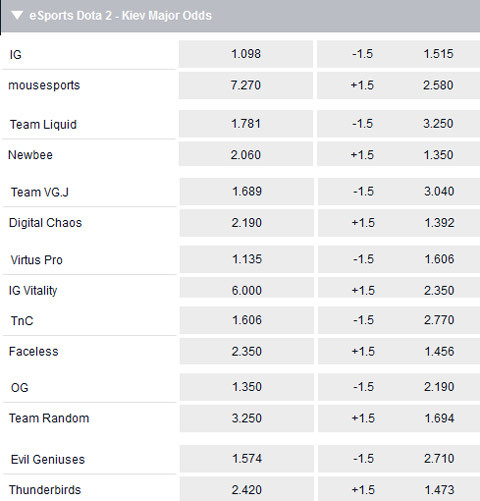 Betting on which team is going to win the Kiev Major is naturally the most difficult one but also the one with the highest odds. There are three favorites this time around: EG, OG and Team Liquid. However this doesn't mean that the winner is going to be one of those three, or even that they will be in the grand finale. If you look at the surprising result of the Boston Major you can see Ad Finem, a team not really rated highly before the event, managed to place second and only losing to OG in the finale. Here you bet on the region the winners will be from. This is an easier bet, as it doesn't matter if Team A or Team B wins as long as the region is correct. 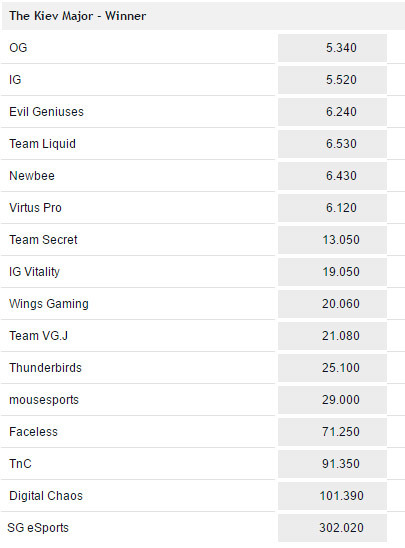 On the other hand one can not be sure as most strong Dota 2 teams come from Europe or China and even North America has a favorite to win in EG. For this bet you place your bets on two teams who you think are going to reach the finale. This has the opportunity to maximize your winnings if you bet on the correct two teams. Or you can bet on your favorites and win even if they lose in the finale to another team. In addition there are bets available for the qualifiers, with the difference that you can bet on the winners of individual matches. There is no tie, so there has to be a winner between Team A and Team B. Even though there are favorites to make it through the Kiev Major qualifiers, like Team NP from North America or Team Secret from Europe, nothing is set in stone and surprises happen in the volatile qualifiers.